Our motivation makes the difference. The legalist obeys God’s commands in order to attain and/or maintain their just standing before God; something that is clearly Christ’s office alone. Evangelical obedience, if I may use that term, obeys out of a renewed heart. i.e. because he is born again and God’s seed dwells in him (1 John 3:9). The thought of abiding in sin goes against the grain of who is is – a Spirit-indwelt believer whose heart now has the law of God written upon it. Being set free from the curse of the law means we are no longer under its condemnation (Rom 8:1) because Jesus has fulfilled the law on our behalf (Rom 8:3-4). But this does not mean we are to cease obeying God’s commands. All of the imperatives or commands of the Bible are considered “law” but indicatives are anything which God does for us us in grace is Gospel. For example, Ephesians 1-3 shows the believer what God has done for him in Christ (indicatives) and then Ephesians 4-6 are the imperatives THEREFORE live like this… The commands are not to gain favor or maintain our standing … but BECAUSE we are saved we have been given a new heart which loves God and desires to obey. 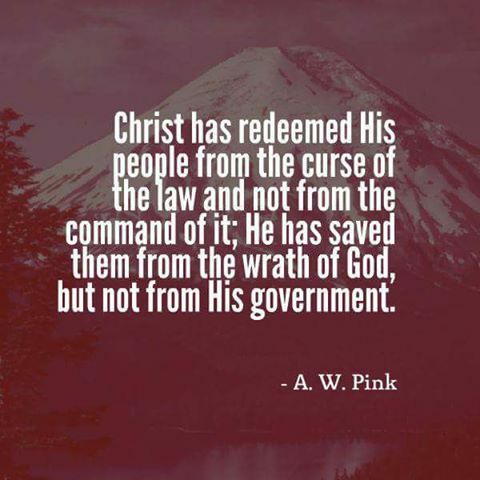 When someone says “KEEP” the law it may sound as if the law were a covenant but Jesus has KEPT the law for us so we are no longer under such a covenant. Now our obedience springs from a new heart that desires to obey the law of Christ.